After almost a week of hotel and restaurant food in Las Vegas I came home mid-week to a refrigerator that very closely resembled that of a bachelor's: a few slices of pizza, cold cuts, and some leftover lasagna that I had conveniently frozen for my husband before I left. So, those several days of dining out in Vegas became almost a week of restaurant dining by the time we made it to the grocery store a few days later. And by that time my body was crying out for something healthy. So, I decided to be proactive and start the next full week back in Chicago on a much healthier note. 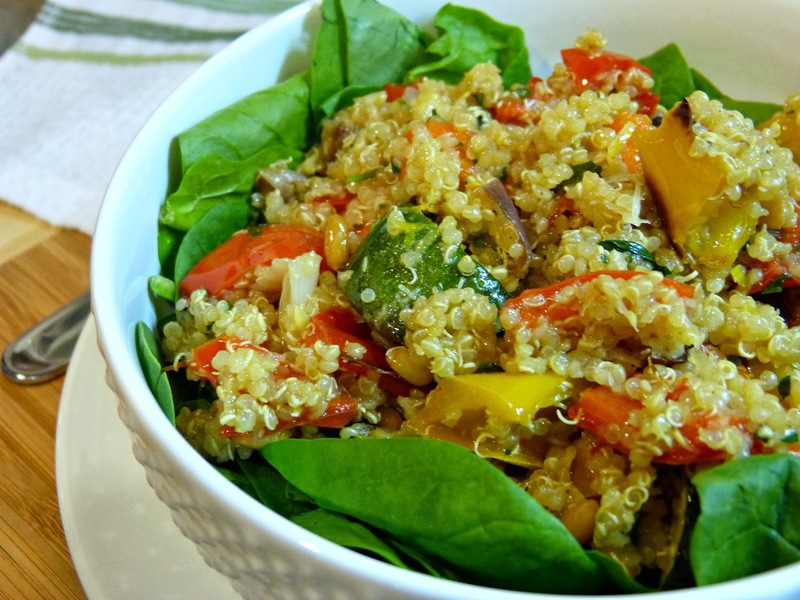 This quinoa salad is the perfect way to jumpstart a week of healthy eating. It's meatless (and even vegan if you omit the grated cheese) and full of fresh vegetables-- raw spinach and a medley of roasted veggies, healthy fats from olive oil and pine nuts, bright flavors from fresh lemon and parsley, and the satisfaction of a bowlful of carbs from healthy and gluten-free quinoa. The flavors here are complex and delicious and this makes for a super filling lunch or would even be a great meatless dinner. And it's actually easier to make a large batch of this than a single serving, so I portioned it out and had lunch for every day of the week... and the flavor gets better everyday! A note on cooking quinoa: I have messed this up many many times. If your quinoa package suggests cooking 1 part dry quinoa to 2 parts liquid, please disregard. Instead, cook 1 part dry quinoa in 1.5 parts liquid to achieve the ideal texture. Soggy quinoa is useless, in my opinion. It's mushy and basically begins to resemble oatmeal... not the ideal texture for tossing into a salad! On a large baking sheet, toss red pepper, yellow pepper, carrots, red onion, zucchini, garlic, 1/4 cup olive oil, Kosher salt, and pepper until evenly incorporated. Spread out on pan and roast for 20 minutes. After 20 minutes, stir the vegetables and then roast for an additional 15-20 minutes until vegetables are caramelized. Remove from oven and allow to cool slightly. Transfer to a large bowl along with any remaining liquid from the baking sheet. In a small bowl, whisk together remaining olive oil, parsley, vinegar, lemon juice, zest, and salt and pepper. 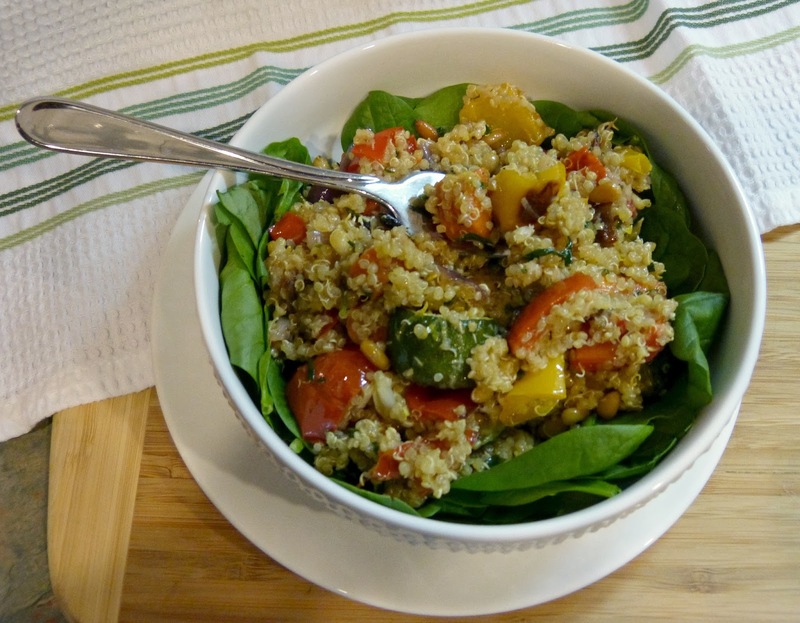 Pour the vinaigrette over vegetable mixture and add quinoa, pine nuts, and spinach. Toss to combine and top with grated Pecorino, if desired. Serve cold or at room temperature. Looking for another great salad recipe? Try this Roasted Vegetable Salad or this White Bean & Artichoke Salad with Pesto Vinaigrette.